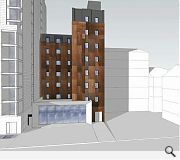 A vacant office building on Glasgow’s Clyde Street has been earmarked for 77 student flats under proposals drawn up by 21st Architecture and Silk (Clyde Three) – following their earlier plans to build a 17 storey tower on an adjacent plot. 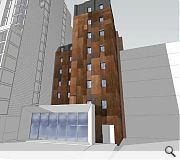 Under the plans a C listed façade fronting Clyde Street would be retained whilst a more radical intervention would be undertaken at Fox Street to the rear which would be overclad in a corten steel mesh, gunmetal aluminum paneling and black zinc roofing. A single storey ground floor extension would also be built, conceived as a ‘large singular floating element’ which would sit within the existing building lines. Internally new lifts and stairs will be installed to improve access. 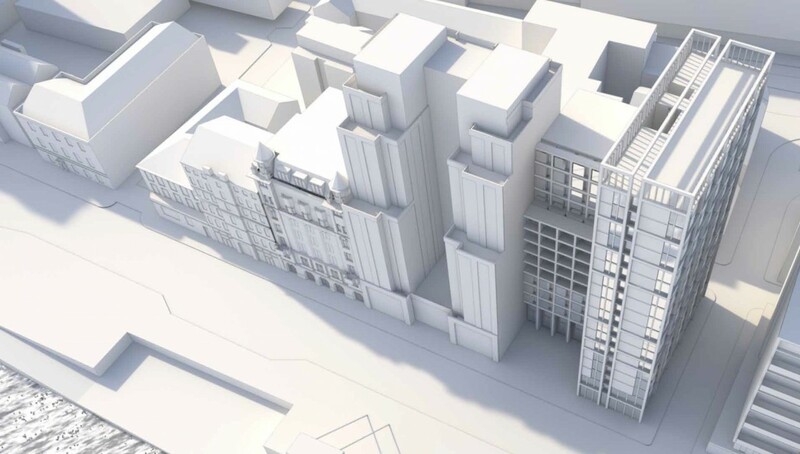 The scheme is the latest in a growing crowd of proposals for the area including a 14 storey tower on the site of Typographical House and, most recently, with plans for a Style Mile hotel tower. I will never understand why the planners think it appropriate to build such height along the Clyde. The design quality of more or less everything built/proposed there in the last half-century has also been utter garbage, this included. 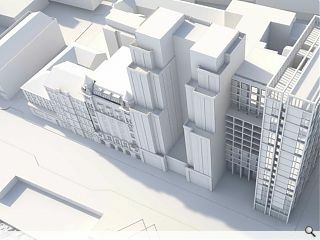 Why not align more or less with the nature and massing of the pre-existing buildings which are now being towered over and made to look ridiculous? And no, that doesn't mean it needs to be historicist or 'pastiche', just take a lead from it. #1 - Completely agree. Riverside House seems a good height for me. Don't think anything on Clyde Street needs to be higher than that. On a positive note I'm delighted to see this building brought back into use. It's been empty far too long. Had started to think it would go the way of Egyptian Halls. @2. I don't think a 12-17 storey wall is something to aspire to. I'd much prefer that the rest of the city is opened up to the Clyde, not overshadowed by the buildings along it. It's better than the gap site currently there. As Charlie says; more height is always welcome, if done right. Hopefully it's tasteful and understated. What's a joke and why wouldn't it happen? Numerous student schemes larger than the sum of these two go forward every year.